Restless River vineyard tour about to begin. Any day that begins in a drop-top 110 Land Rover is bound to be interesting. 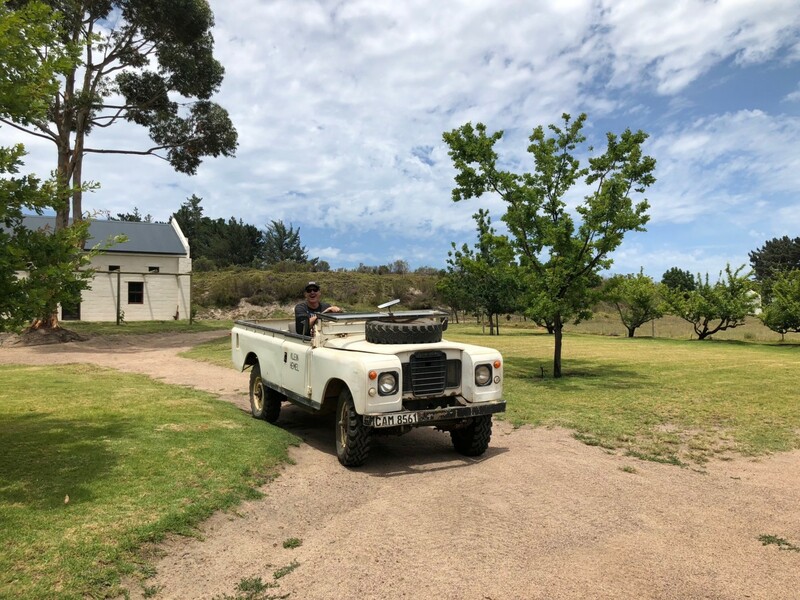 Even more so when it’s Craig Wessels of Restless River Vineyards in the driving seat. Craig isn’t your usual winemaker type – in place of the expected khakis and sleeveless windbreaker are a Nirvana T-shirt and shredded jeans. He’s also an autodidact and thrives on immersing himself in the minutiae of things that interest him such as wine, farming, motorcycles and whiskey. “We did our first vintage in that Wendy House,” says Craig pointing at a very humble-looking hut in a corner of the property as we roll past. 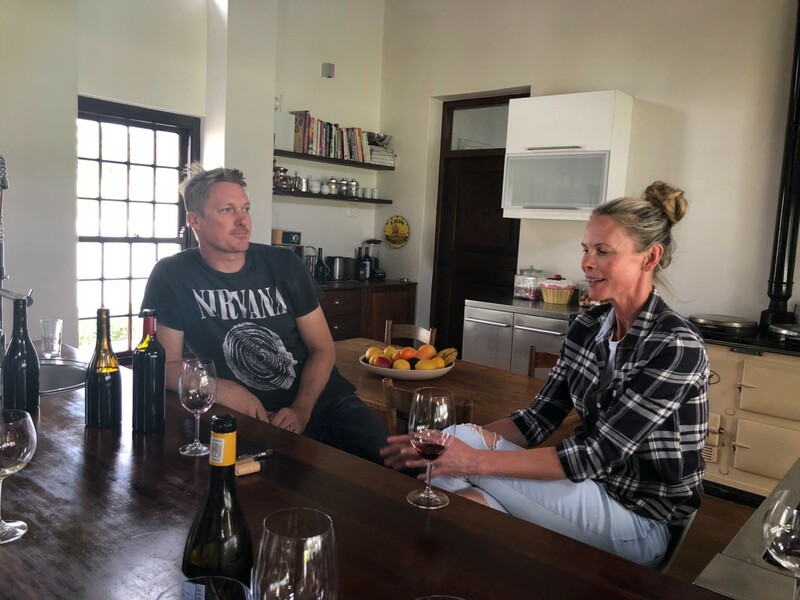 From around 2004, Craig and his wife Anne have been building their Upper Hemel-en-Aarde winery—and their home—from the ground up on Klein Hemel Farm. “We kept running out of money,’ says Craig wryly. The couple have two teenage kids, a boy and a girl. Their offspring was one of the initial reasons for the move to the country: “We didn’t want our kids to grow up in the city.” And then wine gripped, and gripped hard. The first vintage circa the Wendy House years was in 2005, and started out as more of an interest in wine, than a desire to create a business out of it. The Restless River label was launched in 2012 and the wines are now made in the slightly larger farm shed. Craig is starting to think he may finally be able to quit his day job. He owns an animation and design agency Wicked Pixels and has worked in film as a director for over 25 years. “All the blocks are single vineyards. In the cellar I mature the parcels separately so that I can learn more about them, which wood works with what and so on. Because we’re small, that’s the level we can go to. “The idea is that when we get in the cellar we don’t have to do too much. I know it’s a cliché, but it’s one for a reason. “Now the second most important place is in there,” says Craig pulling to a stop in front of the cellar. “In 2013 we moved from the Wendy House to the shed. I still use exactly the same stuff though.” There’s an old press from the 70s, open-top wooden fermenters, a steel tank or two and plenty of wooden barrels in varying sizes. “The forklift has been the greatest acquisition because I like working with gravity. Maybe one day I’ll get proper drainage put in,” he says with a shrug. He has splurged on some new equipment in the form of a pair of amphorae for fermenting parcels of chardonnay, which will likely be used as blending components. Their chardonnay is quickly gaining cult status. For the Ava Marie (named for their daughter), Craig works with old wood and leaves the wine in the barrel to mature for 10 months. The plan is to also start moving to larger barrels for the chardonnay “to show more respect for the fruit”. Craig and Anne Wessels of REstless River. While chardonnay and the Hemel-en-Aarde wards go together like butter on hot toast—the wine that Restless River has built its reputation on is their cabernet sauvignon, made far from the warm embrace of the Stellebosch hills. “I’m not afraid for cabernet to taste like cabernet,” Craig says on his reason for producing a 100% single-varietal cab (not that common in any region). The cab is whole berry basket pressed, spontaneously fermented and is then barrel aged 21 months in 75% old wood (25% new) before being bottled unfiltered. Restless River will be releasing their maiden vintage of pinot noir later this year, made in 2016 from vines planted in 2013. The pinot will initially be released under a second label Lalochezia (the word for the feeling of relief you get when using bad language), and will become part of the RR range once the pinot vines are older. He’s created another label to allow himself some room to play with small parcels. Here the petrolhead in him gets the nod, the range is called DILLIRGAF (a biker acronym that means ‘do I look like I really give a f*ck’). Its first instalment is a 2017 grenache the colour of nuclear plum. Made from Hemel-en-Aarde grapes, the wine is unusual in that it’s been made with three different ferments of carbonic maceration. “I just found all the information out there on carbonic maceration unsatisfying. There’s nothing complete out there. I realised to truly understand the whole process I was going to have to have to do it myself. “I’m never afraid to learn something new.” Restless like that river the wines are named after. I love these wines, though I’ve only tried the Cab and Chardonnay before. Lovely piece by Malu, as always.